Free Resources to Light Your House for Less! With conservation and environmentally-friendly living as such hot topics today, many people wonder how they can play their part in this massive movement. Simple: it all starts at home, and one of the easiest ways to cut down energy drastically is by paying attention to your lighting purchases and usage. Artificial lights in the average American home typically accounts for up to 20% of their annual energy usage! When you consider being able to cut down that amount considerably, it can definitely make a difference to your wallet and to the environment. To get a realistic view of the cost of energy, consider that if every household swapped old bulbs for energy efficient ones, the amount of greenhouse gases reduced would be equal to the gases spewed from approximately ten millions vehicles! Implementing this change can be as easy as switching from traditional light bulbs to compact fluorescent ones (CFLs), and switching off the lights when they're not in use. Although CFLs initially cost more than other bulbs, the savings they incur over time more than makes up for the one-time expenditure. Apart from simply using less energy (up to 75% less! 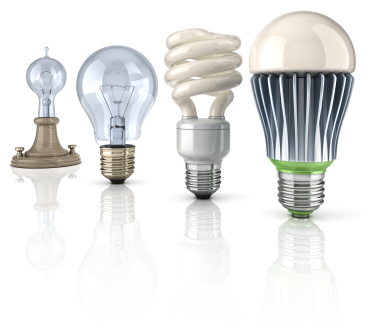 ), CFLs also tend to last years longer than regular light bulbs. Maximizing natural daylight in your home can also make it look larger and brighter, while saving on energy bills. There are even some government rebates and other types of financial incentives to help homeowners make the switch. While we don't often feel like these types of small changes really make an environmental difference, consider how much the difference would be increased if everyone tried to conserve energy in a similar manner. Have a look through the following resources to learn more on energy-saving lighting options, how to reduce artificial light usage at home, maximize natural light and more. What Does an Energy Efficient Bulb Do? How Much Would You Save By Installing Efficient Light Bulbs? How Can I Save Energy With Day lighting?